2002-03-08. New. Ships with Tracking Number! INTERNATIONAL WORLDWIDE Shipping available. Buy with confidence, excellent customer service! Ian Allan Publishing, 2002-02-01. Hardcover. Used:Good. 1977-01-01. New. Ships with Tracking Number! INTERNATIONAL WORLDWIDE Shipping available. Buy with confidence, excellent customer service! Scribner. Hardcover. 068415322X Please allow 4 - 14 business days for Standard shipping, within the US. Thank you for supporting our small, family-owned business! . New. 1977-01-01. First Edition. Scribner. Hardcover. 068415322X Please allow 4 - 14 business days for Standard shipping, within the US. Thank you for supporting our small, family-owned business! . Fine. 1977-01-01. First Edition. NY, SCRIBNER, 1977. FIRST EDITION VERY GOOD. F.
Ian Allan Publishing. Hardcover. 0711007705 New Condition. . New. Surrey England: Ian Allan Publishing, 2001. First published in 1977. 160 pages, prof ill with b&w photos.. Reprint.. Hard Cover. As New/As New. Surrey England: Ian Allan, 2001. 160 pages prof ill b/w photos. Reprint. Hard Cover. New/New. 2002-03-08. Good. Ships with Tracking Number! INTERNATIONAL WORLDWIDE Shipping available. May not contain Access Codes or Supplements. May be ex-library. Shipping & Handling by region. Buy with confidence, excellent customer service! Charles Scribner's Sons. Hardcover. 3881993177 Please allow 4 - 14 business days for Standard shipping, within the US. Thank you for supporting our small, family-owned business! . Fine. 1977-01-01. Book Club Edition. N.
New York, NY: Charles Scribner's Sons, 1977. Hardcover. Very Good/Very Good. Size is 4to. Fully Illustrated. (full book description) Charles Scribner's Sons, New York, NY, 1977. Later Printing, VG+/VG, Hard Cover, w/Dust Jacket. Size is 4to, 160pgs. Fully Illustrated. DJ tapemended(on inside) at foot of spine, o.w. clean, tight & bright. No ink names etc. [Aviation; Military Aircraft; German Military; Airwar] SELLING WORLDWIDE SINCE 1987. WE ALWAYS PACK WITH GREAT CARE! Charles Scribner's Sons, New York, 1977. Hardcover. New. 4to, hardcover. NEW in dust jacket. Bright, crisp & clean, unread; dj glossy w/ tiniest rubbed spot at upper spine from storage. 160 p., illus. London: Ian Allan Publishing, 1977. Hardcover. Fine/Fine. Hardcover in dust jacket. First printing of first edition (1977). Book and price-clipped dust jacket are in fine condition, crisp and clean, with tight binding and sharp corners. Historic photos throughout. 4to. 160 pp. including index. In protective Mylar. Heavy--will require additional postage if shipped outside the U.S.
London: I. Allan, 1977. First? Edition. First? Printing. good. 30 cm, 160, illus., glossary. The development, performance and combat experience of this formidable German fighter in World War II. The author, a distinguished Belgian aviation journalist, has gathered a series of first-hand accounts to accompany the many fine photographs. Scribner, 1977., 1977. 160p. Photos. Oversize. Owner's emboss. Fine/Fine copy. Hard Cover. Fine/Fine. Ian Allan Publishing. Hardcover. 0711007705 Like New Condition. . Fine. Surrey, UK: Ian Allan Publishing, 2001. First Edition. Hardcover. As New/As New. Hardcover in dust jacket. First edition. Book and unclipped dust jacket are in fine, As New, gift-giving condition, crisp and clean, with tight binding and sharp corners. Development and deployment of this airwar-altering fighter plane. Historic photos throughout. 4to. 160 pp. including index. In protective Mylar. Heavy--will require additional postage if shipped outside the U.S.
Charles Scribner's Sons. Hardcover. 3881993177 Please allow 4 - 14 business days for Standard shipping, within the US. Thank you for supporting our small, family-owned business! . Fair. 1977-01-01. Book Club Edition. N.
Old Tappan, New Jersey, U.S.A.: Scribner, 1977. 160pp/illus. The remarkable story of the development and combat experience on many fronts of a singularly effective fighting machine. Clean. 1st Edition. Hard Cover. Near Fine/Near Fine. 4to - over 9¾" - 12" tall. Book Club Ed. Charles Scribner's Sons. Used - Good. Former Library book. Shows some signs of wear, and may have some markings on the inside. Scribner. Hardcover. 068415322X Please allow 4 - 14 business days for Standard shipping, within the US. Thank you for supporting our small, family-owned business! . Fair. 1977-01-01. First Edition. Ian Allan Publishing, 2/1/2002. Hardcover. Like New. Hardcover and dust jacket. Good binding and cover. Clean, unmarked pages. Ships daily. World War II Aircraft: Ian Allen Publishing, 2001. 160 pgs., Photos. Jacket has slightest edge wear. Bumped corners.. Hard Cover. Very Good/Very Good. 4to - over 9¾" - 12" tall. New York, NY: Charles Scribner's Sons, 1977. Hardcover. Fine/As New. Size is 4to. Fully Illustrated. (full book description) Charles Scribner's Sons, New York, NY, 1977. Later Printing, Fine-/Fine, Hard Cover, w/Dust Jacket. Size is 4to, 160 pgs. Fully Illustrated. Clean, tight & bright. NO ink names, bookplates, DJ tears etc. ISBN 068415322X [Aviation; Military Aircraft; German Military; Airwar] SELLING WORLDWIDE SINCE 1987. WE ALWAYS PACK WITH GREAT CARE! World War II Aircraft: Charles Scribner's Sons, 1977. 160 pgs., Photos. Jacket has light edge wear.. Book Club (BCE/BOMC). Hard Cover. Very Good/Very Good. 4to - over 9¾" - 12" tall. New York, NY: Charles Scribner's Sons, 1977. Hardcover. Fine/Very Good. Size=8.5"x11". Fully Illustrated. (full book description) Charles Scribner's Sons, New York, NY, 1977. Later Printing, Fine/VG, Hard Cover, w/Dust Jacket. Size=8.5"x11", 160pgs. Fully Illustrated. 3/8" DJ tears (4), o.w. clean, tight & bright. NO ink names, bookplates etc. ISBN 068415322X [Aviation; Military Aircraft; German Military; Airwar; Military Aviation] SELLING WORLDWIDE SINCE 1987. WE ALWAYS PACK WITH GREAT CARE! New York: Charles Scribner, 1977. First Edition. Hardcover. Fine/Fine. Hardcover in dust jacket. First edition. Book and unclipped dust jacket are in fine condition, crisp and clean, with tight binding and sharp corners. 4to. 160 pp. including index. In protective Mylar. Heavy--will require additional postage if shipped outside the U.S.
New York: Charles Scribner's Sons, 1977. Very Good/Very Good. Book club edition. Quarto. 160pp. Illustrated from black and white photographs. Edges lightly rubbed, corners and spine ends lightly bumped, very good in a very good dustwrapper, edges lightly worn, spine a touch sunned. New York: Charles Scribner's Sons, 1977. Near Fine/Very Good. Probable book club edition. Quarto. 160pp. Illustrated from black and white photographs. Edges lightly rubbed, near fine in a very good price-clipped dustwrapper, edges lightly worn, spine a touch faded. World War II Aircraft: Charles Scribner's Sons, 1977. 160 pgs., Photos. Jacket has couple of tiny edge tears and slight wear.. Book Club (BCE/BOMC). Hard Cover. Very Good/Very Good. 4to - over 9¾" - 12" tall. New York, NY: Charles Scribner's Sons, 1977. First Edition. Hardcover. Very Good/Very Good. Size=9"x12". Fully Illustrated. (full book description) Charles Scribner's Sons, New York, NY, 1977. 1st Ed. (U.S.) VG+/VG, Hard Cover, w/Dust Jacket. Size=9"x12", 160pgs. Fully Illustrated. 1/2" DJ chip & book cover bumped foot of spine, o.w. clean, tight & bright. No ink names, bookplates etc. ISBN 068415322X Price unclipped. [Aviation; Military Aircraft; German Military; Airwar; Military Aviation] SELLING WORLDWIDE SINCE 1987. WE ALWAYS PACK WITH GREAT CARE! New York: Scribner's, 1977. Hardcover. Very Good/Very Good. Very good or better in a Very good plus dustwrapper. (Pages: 160) Former owner's name on front endpaper and half title. Please Note: This book has been transferred to Between the Covers from another database and might not be described to our usual standards. Please inquire for more detailed condition information. Charles Scribner's Sons. Near Fine in Very Good+ dust jacket. 1977. Hardcover. 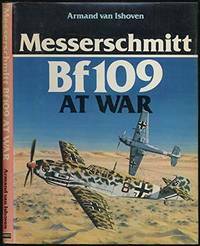 Matched in the early stages of World War II only by the Spitfire, the Messerschmitt Bf 109 was undoubtedly one of the greatest combat aircraft of all time. It first flew in 1935. It was the the dominant fighter in the Luftwaffe until 1941, and it served on all war fronts and with the air forces of Bulgaria, Hungary, and Rumania among others. Closed tear about 1" at upper edge of DJ front panel, with tiny chips at upper edge of DJ spine. Interior and blue boards especially clean, like new. ; Book Club Edition; Cover Art; 4to 11" - 13" tall; 159 pages; 30444 . Used; Very Good. Pub. Scribners, 1977. Book Club Edition. Hardcover. Book Condition: Very Good. Dust Jacket Condition: Very Good. . 0. Book Club Edition. HARDCOVER. NEW YORK: CHARLES SCRIBNER'S SONS. G/G LIGHT EDGEWEAR. BINDING SLIGHTLY STRAINED AT TITLE PAGE. Pages: 160. . 1977. BOOK CLUB. HARDCOVER.. DJ SUNNED AT SPINE, EDGEWORN, A FEW SMALL TEARS. PAGES CLEAN. DJ IN MYLAR WRAP. . Condition: G/G LIGHT EDGEWEAR. BINDING SLIGHTLY STRAINED AT TITLE PAGE. Pages: 160. NY: Scribner's. Very Good in Good dust jacket. 1977. First Edition. Hardcover. 068415322x . 160 pp., illus. .
London: Ian Allan, 1977. 160pp. Fully illus.. First Edition. Cloth. Vg/Vg. 11.75" x 8.75". New York: New York: Scribners, 1977. Scribners, 1977. Hardcover. Fine/Fine. Book club edition. Hardcover. B&W photos. Light wear. Fine book in fine dj. Messerschmitt Bf 109 at War. Scribners, 1977., 1977. 160p. Photos. Large format. BCE. Near Fine/Very Good. Hardcover. Near Fine/Very Good. Ian Allan Publishing. Hardcover. 0711007705 First Edition 1977. Slight discolouration to end papers, overall a very good copy with no inscriptions in a very good dust jacket with no tears . Very Good. 1977. First Edition. USA: Scribners, 1977. Book Club Edition. Quarto. VG/VG-. dj, red spine with white title; HB, blue leatherette boards and spine with gilt titles; ex libris, name, head-edge; minor shelf wear and bumping; text.block clean; 160 pp. ; photos, plates, and figures; dj, sunned; chipping and wear; else very good. Shelved Rockville Bookstore. SCRIBNERS, 1977. Book. Very Good. Hardcover. Book Club (BCE/BOMC). 4to - over 9¾" - 12" tall. 160 PAGES. PICTORIAL DUST JACKET WITH RED SPINE. HARDCOVER BOOK. LIGHTLY SHELF-COCKED. LIGHT EDGE WEAR ON JACKET. BOOK IS CLEAN, BRIGHT AND SECURE SCRIBNERS. 1977, Book Club (BCE/BOMC). 4to - over 9¾" - 12" tall. London: Ian Allan, 1977. 1st edition, large 4to, 128pp, photo illustrations, previous owner's name stamp to fr pastedown o/w VG+ Copy in VG+ DJ; NB This is a large heavy book; the postage for this item is well outside that set by the various sites. However, for simplicity the price has been adjusted accordingly; no extra postage will be needed for this item unless purchaser requires overseas sending. First Edition. Hard Cover. Very Good/Very Good. 4to - over 9¾" - 12" tall. Ian Allan Publishing, 2002-02. Hardcover. Good.